Technology is supposed to be our friend, making our lives easier. Each year, the list of devices we have seems to grow a little longer: cell phones, computers, tablets, e-readers, iPods… How are we supposed to keep track of all of this stuff?!? A few days ago my computer decided to wipe my camera’s SD card clean before I could upload the pictures for this week’s post. As if I didn’t already have enough on my mind ahead of Thanksgiving! It was a bummer, but I tried not to get too down about it. The good news? I got to prepare and photograph another favorite for this post! It worked out perfectly. Turns out Evan had signed up to bring a green salad for his office potluck lunch this week, and with our crazy schedule, he asked if I would mind whipping one up for him. This is, if I may be so bold, a great salad recipe. It’s hearty and tangy, and has proven a real crowd-pleaser at our dinner table time and time again. 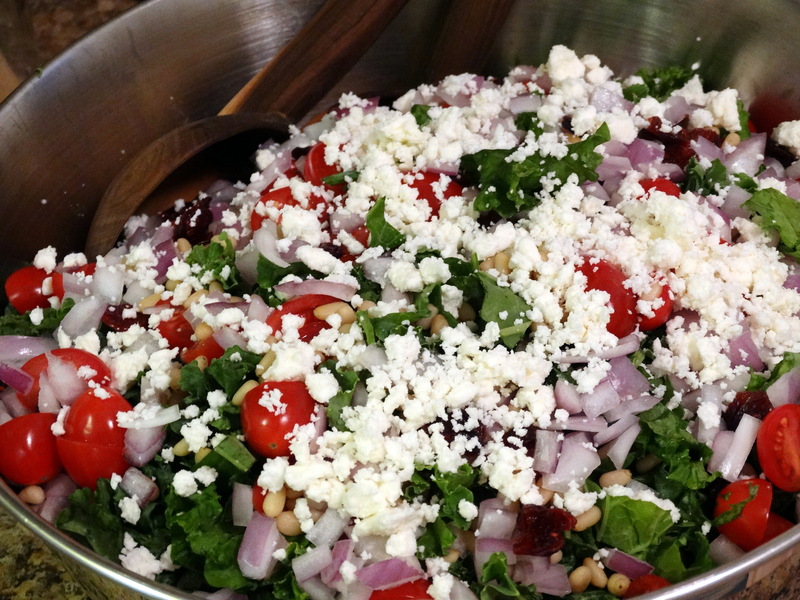 You will need fresh kale, dried cranberries, pine nuts, a red onion, cherry tomatoes, crumbled feta cheese, a lemon, garlic, olive oil, balsamic vinegar, salt, and pepper. Wash and dry the kale. A salad spinner is a great way to get this done quickly. Remove the ribs and cut the leaves into strips. You will need about 6 cups of kale for this salad. One good-sized bunch should be more than enough. 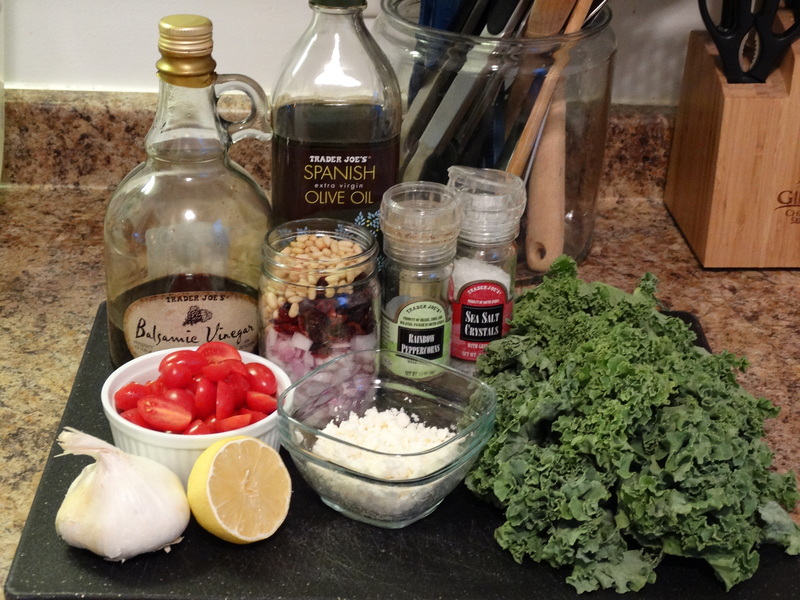 Place the kale in a large salad bowl. 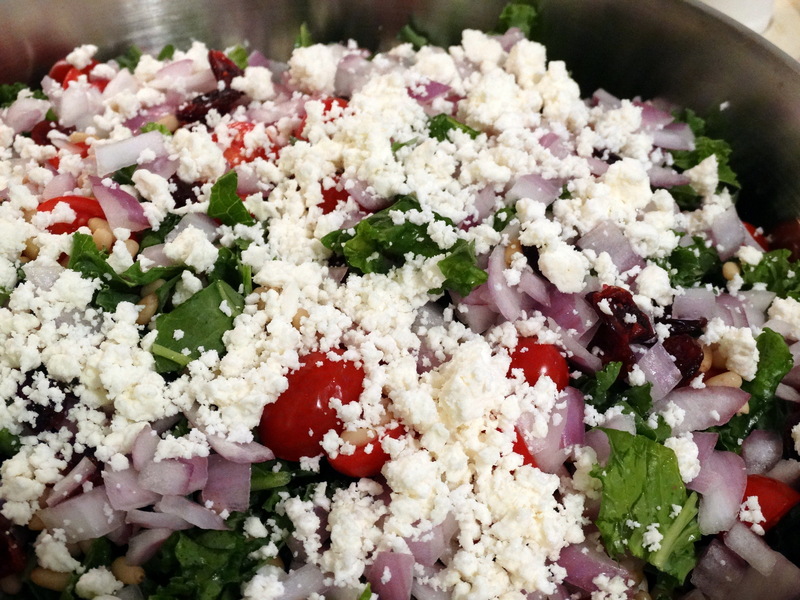 Top it with 1/2 cup dried cranberries, 1/2 cup raw pine nuts, 1/2 cup diced red onion, 1/2 cup halved cherry or grape tomatoes, and 1/3 cup crumbled feta cheese. To make your dressing, juice one lemon. 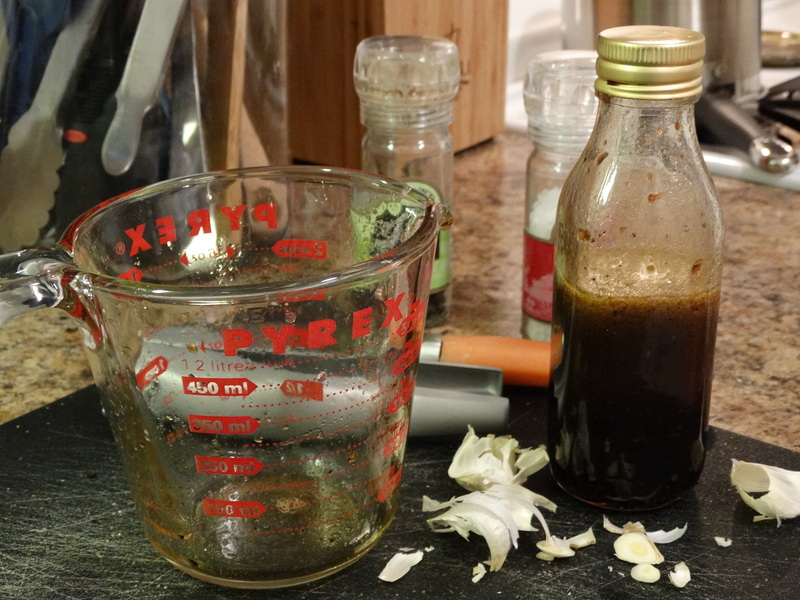 Add 2 cloves of minced garlic, 1/4 cup olive oil, 1/2 cup balsamic vinegar, 1/2 teaspoon coarse sea salt, and 1/2 teaspoon freshly ground pepper to the lemon juice. Whisk it all together or place it into a jar and shake until evenly mixed. Pour the dressing over the salad and refrigerate for at least 4 hours prior to serving. The longer you let it sit, the better and tangier it will be! Enjoy! 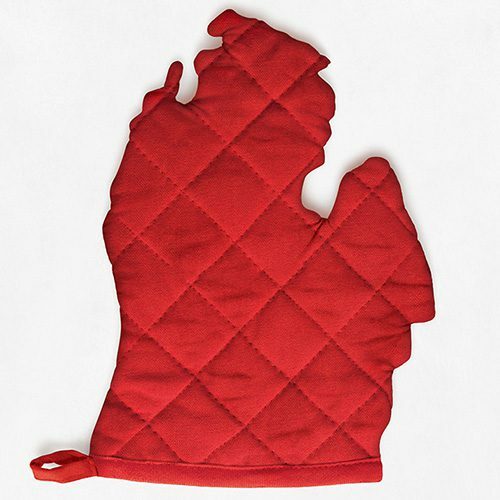 1) Wash and dry the kale. Remove the ribs and cut the leaves into strips. 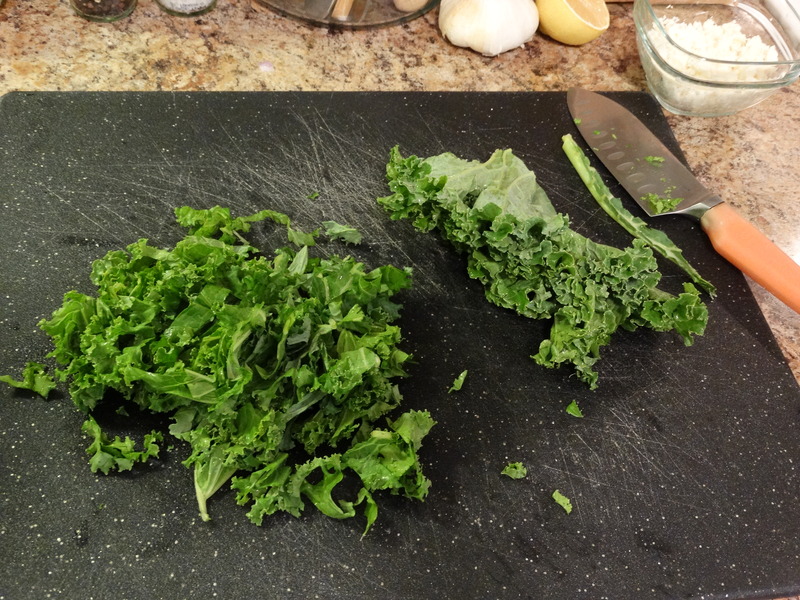 2) Place the kale in a large salad bowl. Top it with 1/2 cup dried cranberries, 1/2 cup raw pine nuts, 1/2 cup diced red onion, 1/2 cup halved cherry or grape tomatoes, and 1/3 cup crumbled feta cheese. 3) Juice one lemon. Add 2 cloves of minced garlic, 1/4 cup olive oil, 1/2 cup balsamic vinegar, 1/2 teaspoon coarse sea salt, and 1/2 teaspoon freshly ground pepper to the lemon juice. Whisk it all together or place it into a jar and shake until evenly mixed. 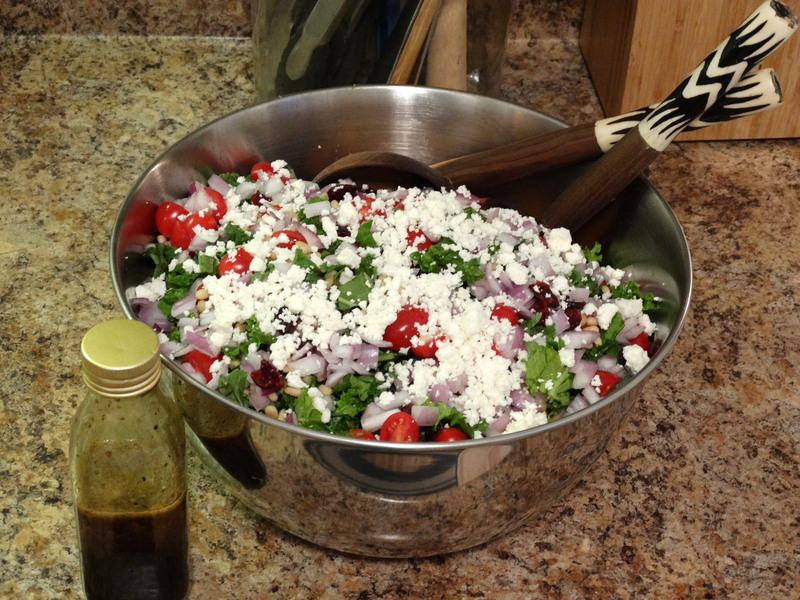 4) Pour the dressing over the salad and refrigerate for at least 4 hours prior to serving. Enjoy! This looks so good! Love kale!